Relentless sniper fire and random bombing marked Kate Adie’s worst days covering the news from war zones around the globe. Five rounds rocked her land rover, literally lifting her to the roof, as metal sliced into her thigh. “Kate appeared at so many turbulent datelines that it led to the saying, ‘Never mind the sheriff, when Katie Adie hits town it’s time to get out of Dodge City,’” said Stephen Claypole, former CEO of Associated Press Television News. During the first Gulf War, Adie slept overnight in a freshly dug grave after flying into a bombed-out region in Kuwait. She tracked down Mujahedin fighters in Afghanistan, who cleared away ammunition boxes for a lengthy lunch during the war with Russia in 1989. As Bangladesh flooded in 1988, Adie and her crew filmed and bailed as they floated along to cover the disaster. Adie traced the plight of forsaken refugees in Rwanda fleeing to the border of Zaire after tribal massacres. And she was in Sierra Leone reporting the action during the British military intervention in 2000. Her deadpan British wit remains intact recounting how she survived five rounds of mortars inside a land rover in Bosnia, except for a chunk of metal in her foot. “You want your toes, yes?” she recalls the surgeon later saying. “So you keep ze bullet in there.” She suffered a gunshot wound in her elbow during the Tiananmen Square protests and an injured collarbone after an irate Libyan shot her. Adie’s “defining moment” as a journalist was in April 1980, when she covered the dramatic ending of a six-day siege of the Iranian embassy in London when special forces stormed the building and released terrified hostages. The BBC interrupted sports coverage, and Adie reported live and unscripted while crouching behind a car door. By the early 90s when she was covering Bosnia, Adie sensed a “big change” in the media landscape with more women than men reporting on the frontlines. “More women were making it into the newsroom, but at the same time some felt constrained to volunteer to go to war. Quite a few said they wouldn’t be there covering the war if it weren’t for the pressure. But I wanted to go,” she said. Adie, now a presenter on BBC Radio 4’s “From Our Own Correspondent,” has become “a role model for female journalists the world over,” said Reuters News Global Editor Chris Cramer, formerly of BBC. Cramer said that after years of reporting with “passion and sensitivity,” Adie pulled back from covering war zones in 2003 and turned to documentary work for BBC. She went on to write “Corsets to Camouflage,” a history of women in wartime, and “Nobody’s Child,” a book describing her adoption as “my first appearance in court as a babe in arms.” Adie has won three Royal Television Society News Awards, the Broadcasting Press Guild’s Award for Outstanding Contribution to Broadcasting, the Bafta Richard Dimbleby Award and an Order of the British Empire. She is honorary professor of journalism at the University of Sunderland and has an honorary fellowship at the Royal Holloway at the University of London. 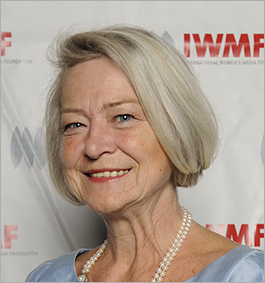 Kate Adie is the first IWMF Lifetime Achievement Award winner from the United Kingdom. Marie Colvin, another journalist from British media, won the Courage in Journalism Award in 2000.